I was knitting on my Twig and Leaf last night while watching an episode of War and Peace and I was so close to the end, I was determined to finish it. Well I made it to the end but I saved the bind off for this morning. It is almost 470 stitches and I was not in the mood to do that at 11:00pm. Oh, and that series of War and Peace, while it’s film quality is showing it’s age, is pretty true to the book and I am watching it as I read along. It has 25 hour long episodes and a guide book so you get a summary of what part of the book is in each episode. I am quite a bit ahead in my reading of where I am in the series. It is a nice supplement and gives me something interesting to watch while I knit. So anyway, this morning while I was having my coffee and checking email I got the shawl bound off and took it out for a few pictures before I soaked and blocked it so you could see the transformation. 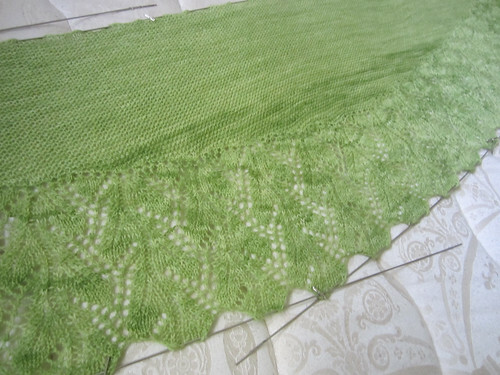 It isn’t actually that drastically different because I prefer to leave a bit of “texture” in my knitting. I am not an aggressive blocker. 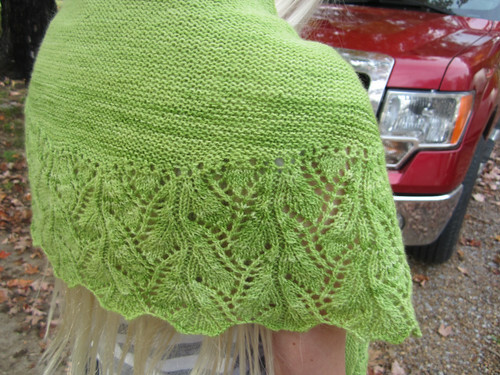 I really love how this came out and I could see making this again sometime in a darker more dramatic color or maybe even a subtle variegated color way. 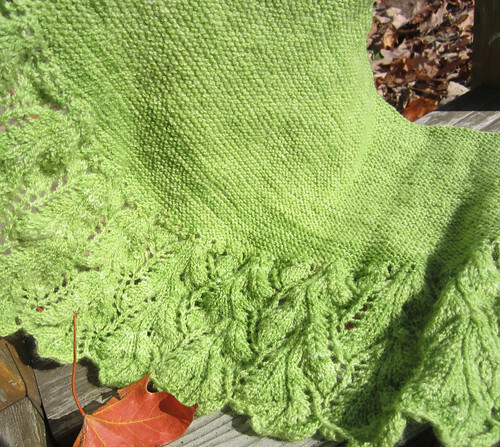 The pattern was of course impeccably written and I feel like it is a good project for a beginning lace knitter to cut their teeth on. It has just enough difficulty in the short row section to make it interesting but not frustrating. 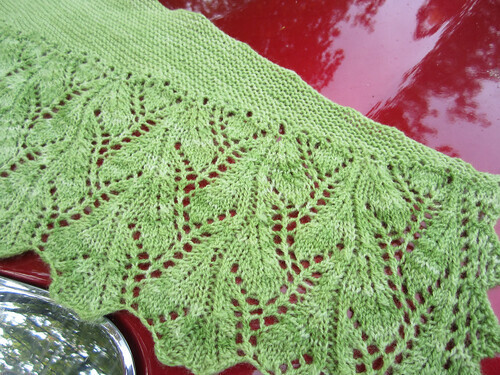 The lace was not too difficult and I found I hardly needed to look at the chart once I got going on it. It is not nearly as difficult as it looks. But let that be your little secret if you want to impress your non-knitting friends, LOL! It is starting to look like fall a bit early here in Tennessee. 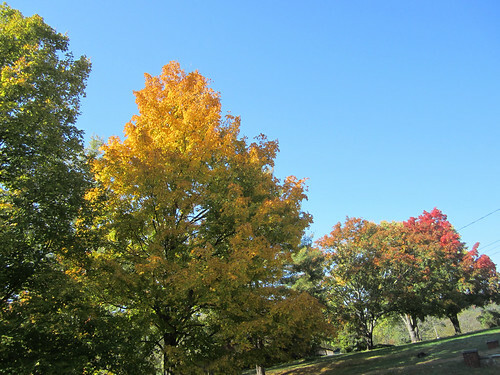 When we were in northern Virginia it was starting to show some colors too, but when we left Nashville for VA the leaves were still all green. This is what they look like in my yard today.